Cristiano Ronaldo kept Real Madrid title hopes alive as he scored a hat-trick to lead his team to victory at Sevilla, where all La Liga clubs –including Barcelona– had failed to win this season. 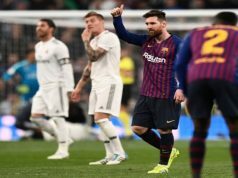 The hosts fought hard in the second half to try to salvage a point, but Los Blancos defended well and maintained the two-point difference with leaders Barcelona. The Portuguese international opened the score before the half-hour mark, sending a superb header past Sergio Rico after receiving a cross from James Rodriguez. It only took Ronaldo two minutes to double his side’s lead. Daniel Carvajal raided down the right flank and sent the ball into the box where the Portuguese fired it home at the back post. However, Sevilla would shorten Los Blancos lead one minute before the break. Sergio Ramos made a terrible mistake taking Aleix Vidal down inside the box and the referee awarded the penalty. Carlos Bacca held his composure and send Iker Casillas the wrong way to make it 1-2. Sevilla exerted a high pressure in the second half, but Ronaldo would increase Los Merengues lead thanks to a great cross from Gareth Bale. The Portuguese made contact with his header and lifted the ball into the top corner over Rico. Nevertheless, the hosts never gave up and scored their second with ten minutes to go as Iborra made an immediate impact from the bench slotting the ball into the bottom corner from Vidal’s cross. Unai Emery men had a couple of chances to savage a point, but Los Blancos defenders managed to clear the ball every time and secured a crucial victory to stay alive in La Liga.